The website costumedirect.com.au and shop.costumedirect.com.au is owned and operated as an online costume store by All Costumes Great and Small (ABN 68229603805). So are all web pages under these domain names. Use of the Costume Direct site is dependent upon your adherence to the Terms & Conditions outlined here. By browsing this website or purchasing products from it or becoming a member you agree to the Terms & Conditions outlined henceforth. If you do not agree to these Terms & Conditions, do not use the website. The Terms & Conditions of Costume Direct online costume store are subject to change without notice or warning and changes become effective immediately. It is your responsibility to be aware of the Terms & Conditions, and only use the site if you are compliant. Some features of the Costume Direct website are only available when you create an account. When you register, you will be asked for your name and email address and will be required to create a password. You must fill in the required fields with complete information which is accurate at the time. You must keep your password secret at all times and not disclose it. When you are 'logged in' you are able to subscribe/unsubscribe from Email updates, change your password, and view previous orders you have placed with this account. You are also able to update Shipping/Billing details (if these have been provided in the past). If you decide to place an order, you will be asked for additional details; shipping address, billing address and phone number (see our delivery page for details if you would like to collect your order from the retail store All Costumes Great and Small). Once again, you must fill in the required fields with complete information which is accurate at the time. It is an illegal violation to place orders with false details provided, such as a false name. You must notify us immediately if any of your details change, or log in to your account and update your details. You will also be asked how you found out about Costume Direct. There is also a place for you to fill in any notes regarding your order (this is an optional field during the checkout process). All content contained on the Costume Direct website is protected by copyright. This includes pictures, logos, text and animations. This material is only for non-commercial and personal use. Some of the material used in the Costume Direct webpage is also protected by the copyright of companies of products we stock, with their permission. Use of any of the content (including images, text, logos or any other part of the site) of the Costume Direct webpage, without express prior written permission from Costume Direct, is prohibited. 'Use' includes copying, modifying, posting, distributing, republishing, or reproducing the material on the Costume Direct site in any way. Any use of content from the Costume Direct site that does not adhere to this condition may be subject to criminal penalties. 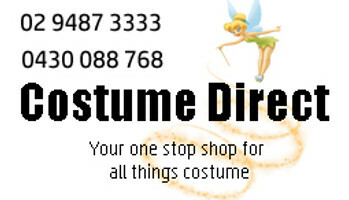 The Costume Direct site is owned & operated by All Costumes Great and Small in Sydney, within New South Wales, of the Commonwealth of Australia. The site is subject to the law of the Commonwealth of Australia and use of the Costume Direct website is governed by the Laws of Australia. Legal action which may result from use of the Costume Direct website will be enforced under the laws of Australia. Your use of the Costume Direct Website indicates you submit to the jurisdiction of the courts of Australia and you agree any legal action you pursue against Costume Direct / All Costumes Great and Small will be within the jurisdiction of the Australian courts, exclusively. See our Refund and Return Policy. Costumes may be changed by manufacturers without notice or be produced by different manafacturers. Changes are beyond our control. Because of this we do not guarantee the costume you order will be exactly as shown/described on screen, though we will certainly update our pictures and descriptions as soon as we are aware of any alterations to a product. If you are not satisfied with the costume, you may return it subject to normal refund and return policies. Costume Direct reserves the right not to accept your order if the item is not in stock, if you do not provide us with valid payment details, if the payment is not authorized, if the details you have provided us are incorrect or incomplete, if you are in breach of any of the Terms & Conditions or at the discretion of Costume Direct. Placing your order and receiving e-mail confirmation that it has been placed is not the same as us accepting your order. In most cases orders are accepted, however you will be notified promptly if your order is not accepted. Orders will only be sent once full payment has been received and products will not be held for customers without payment. Please inform us via e-mail if you intend to pay via Direct Deposit or Cheque. A 10% GST amount is included in the price of every item sold on the Costume Direct website. Currency provided on the Costume Direct website is in Australian Dollars. Payment methods available to users are Paypal, Visa or Master Card, Direct Debit, Money Order or Cheque. If paying via Direct Debit, Money Order or Cheque it may take a few days for payment to be processed and Costume Direct is under no obligation to hold or send stock until payment is received. Payment must only be made by/with permission of the authorized card or account holder. It is an illegal violation to use fraudulently obtained card details to place an order, or without the permission of the card/account holder. Links to other sites are occasionally provided on the Costume Direct site. The content of these sites may not be reflective of the views of Costume Direct, and the inclusion of a link does not indicate the endorsement of the product or services it promotes. Links are given for the users convenience only. From time to time there may be broken links within the site. Because of this we CAN’T alter or change your order after you have submitted it. We ask that you double check all details before submitting the order. Occasionally Costume Direct will send parts of your order separately. This is to get your order to you ASAP. Additional shipping time is noted in the Product Descriptions. You will be informed via e-mail if your order needs to be shipped from different places and will not incur any additional postage expense as a result. By using the Costume Direct website you indemnify Costume Direct from any loss that may be suffered as a result of your activities on the site or your breach of the Terms & Conditions set out here. Your Costume Direct account may be suspended at any time without notice if you violate any of the Terms & Conditions of the Costume Direct site. There is to be no spidering, monitoring or interfering with the Costume Direct site. Violation of this Term of Use will result in immediate termination of your account and you may be subject to legal action.